This past Sunday The Morgan School was graced with a gift of culture. We received something very out of the ordinary and also very special. Emily Bear, a thirteen year old piano prodigy, decided to give us quite a show! She performed a few of her pieces in our auditorium for no charge at all. This concert gave students the option to have a little bit of culture injected into their technology based way of thinking. This girl is the real deal. She performed in front of some of the most paramount members of the nation including the former President of the United States George Bush. She also appeared on the Ellen DeGeneres show. But why The Morgan school? What made this young Beethoven-et decide to shed her special light on us? Emily Bear was born in Rockford, Illinois and lived with her family of five with two older siblings and her parents. She was a very normal kid, besides the fact that she was a musical genius. Her family discovered that she was a musical talent soon after she was born. At age two, she began to play, and soon after it was her grandmother who discovered her very obvious talent. While she was still basically a toddler, she began to study piano at the Music Institute of Chicago. There she began to learn from Emilio del Rosario! Emilio only accepted students who auditioned for him, and he, being one of the most respected pianists in the world, must have really thought Emily had what it took to be a star. Not only was Emily a great piano player, she was an even better composer! She began composing her very own pieces at age three, while most of us were still learning the letters of the alphabet. Her compositions were no rinky dink pieces, they were extraordinary. Her master ‘Northern Lights’ won her the ASCAP Foundation Morton Gould Young Composer Award for composers under 18 years of age. But that was not all she had won… She took home the RAMI, Rockford Area Music Industry Award, as well. Another very exciting accomplishment she had was when she played at the Hollywood Bowl at age 10. Playing in front of a full crowd there would have made any lesser human crumble with fear before even touching the stage. After speaking with Emily about the concert she performed here last Sunday, she explain why she performed for free: “The concert series that organized this concert was with the New Haven Symphony in honor of a man from Clinton named George Flynn. When he passed away, he left a trust fund to pay for major performing artists from all over the world to come to Clinton, CT to perform concerts. All the tickets for these concerts would be free.” She also had a lot to say about her trip to the White House. “It was very exciting to perform at the White House. I was more excited than nervous. We were the first to arrive because I had to practice before the guests came. 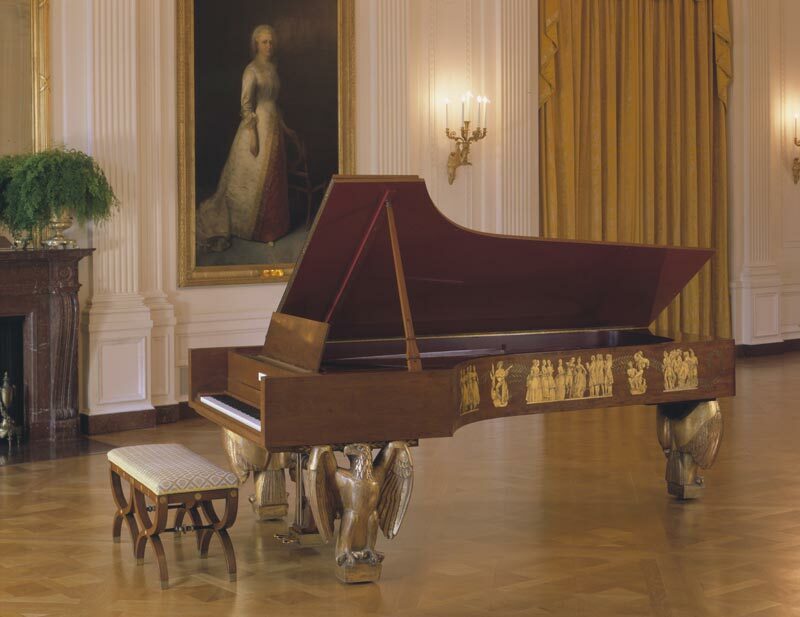 The piano at the White House is a very special piano that was made by Steinway – The legs of the piano are American Eagles!! Look up the piano on google to see it – it is the only piano like it in the world.” In addition to playing in front of the president, she told us her other favorite venues were Carnegie Hall, China, and the two palaces that she performed at in Vienna, Austria! Finally when Emily was asked about her inspiration for all that she does, she told us, “I love composing and performing. It is so much fun, and I enjoy working towards a goal like writing a film score or learning the Rhapsody In Blue for a concert. It feels so good when you accomplish your goal!”. There is no doubt that she put on quite a show here at our humble high school, and we were lucky to be able to experience her beautiful music live and in person. As Emily grows up and becomes bigger and bigger we can only hope that she continues to enjoy playing for us as much as we enjoy listening. Extremely cool witnessing a young kid get into hobbies especially music that she can one day give to the world. I had no idea she was at our school to preform I totally would have gone If I were given notice. This article was extremely well written and informative. This article was cool. I didn’t even know she came here. I wish I was able to go. She must be a really good pianist. I also love your title. Really awesome to see young people getting involved in music and art, and being good at what they do. As a person who loves to listen to music, this post is very inspiring to people who like to create music. This article is really cool and informative, I had no idea she came to Morgan to perform, she seems like she is really good at the piano and this article makes me want to search some of her work and listen to it. It is also really cool how she got an invite to the White House and how amazing she is at music at only age thirteen.